Director Ridley Scott has been deliberately coy over the past few years when it comes to whether or not Prometheus is in any way connected to Alien. There have been rumors that it’s a direct prequel, or that any connections are minor. Some have said the infamous xenomorphs would be putting in an appearance, while others insisted that was just feverish fanboy wishful thinking. Despite Scott always playing it close to the vest, the recently released trailer seemed to remove all doubt: whether it’s an actual or prequel or not, Prometheus is definitely connected to Alien somehow. The Prometheus trailer was riddled with clues, from the Alien-style logo to the appearance of a ship that looks awfully familiar to fans of Scott’s earlier film. 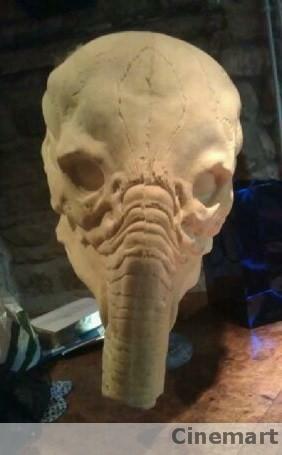 And then, of course, there was the Space Jockey. The iconic and mysterious alien pilot dubbed “the Space Jockey” was discovered mummified in his chair by the crew of the Nostromo in Scott’s 1979 film, and he/she/it has been the subject of much speculation since then. As you can see, it’s not an exact match for the Alien Space Jockey, so this could be everything from a redesign to differences relating to the film’s top secret plot. Interestingly, this prop looks to be human scale, so it could be an actual mask worn in the film — by whom or for what purpose, there’s no telling. Either way, it’s an interesting tidbit from one of this year’s most anticipated films, and it makes the wait until June 8th seem that much longer. a ship that looks familiar, yes because its the same ship, the whole world already knows this.